The management of diabetes self-care is largely the responsibility of the patient. With more emphasis on the prevention of complications, adherence to diabetes self-care regimens can be difficult. Diabetes self-care requires the patient to make many dietary and lifestyle changes. This study will explore patient perceptions of diabetes self-care, with particular reference to the burden of self-care and coping strategies among patients. A maximum variation sample of 17 patients was selected from GP practices and diabetes clinics in Ireland to include patients with types 1 and 2 diabetes, various self-care regimens, and a range of diabetes complications. Data were collected by in-depth interviews; which were tape-recorded and transcribed. The transcripts were analysed using open and axial coding procedures to identify main categories, and were reviewed by an independent corroborator. Discussion of the results is made in the theoretical context of the health belief, health value, self-efficacy, and locus of control frameworks. Patients' perceptions of their self-care varied on a spectrum, displaying differences in self-care responsibilities such as competence with dietary planning, testing blood sugar and regular exercise. Three patient types could be distinguished, which were labeled: "proactive manager," a patient who independently monitors blood glucose and adjusts his/her self-care regime to maintain metabolic control; "passive follower," a patient who follows his/her prescribed self-care regime, but does not react autonomously to changes in metabolic control; and "nonconformist," a patient who does not follow most of his/her prescribed self-care regimen. Patients have different diabetes self-care coping strategies which are influenced by their self-care health value and consequently may affect their diet and exercise choices, frequency of blood glucose monitoring, and compliance with prescribed medication regimens. Particular attention should be paid to the patient's self-care coping strategy, and self-care protocols should be tailored to complement the different patient types. Diabetes is both a lifelong and a twenty-four hour a day condition. Glucose control is almost entirely in the hands of the person who lives with this condition. His/her motivation to eat, exercise, take medication, test glucose levels, and maintain a normal body weight all vie with life's other motivations. One of the biggest challenges for health care providers today is how to address the continued needs and demands of individuals with chronic illnesses like diabetes . Conversely, the challenge for patients is how to obtain the necessary skills to effectively manage their diabetes. Recent research has increased the emphasis on tight metabolic control as several large intervention studies have indicated maintaining good metabolic control can delay or prevent the progression of complications associated with diabetes [2–5]. The introduction of home blood glucose monitors in the 1980's and widespread use of glycosylated haemoglobin as an indicator of metabolic control have also contributed to changes in the approach to diabetes self-care, and thus have shifted more responsibility to the patient . The advancements in technology and recommendations from these studies are very important and convincing but present health care providers with the challenge of implementing them in practice. A recent qualitative study examining self- monitoring of blood glucose in patients with type 2 diabetes suggests the role of the health professional is crucial to patient understanding of their blood glucose fluctuations and whether or not the patient responds to the high blood glucose reading with an appropriate self-care action . Diabetes self-care requires the patient to make many dietary and lifestyle changes simultaneously further emphasizing the need for self-care management support. A meta-analysis of self-management education for adults with type 2 diabetes, reported self-management education improves glycaemic control at immediate follow-up, and increased contact time increases the effect . However, the benefit declines one to three months after the intervention ceases, suggesting that learned behaviours may change over time and continuing education is necessary . Prescribed regimen changes can also impact the patient, as Bradley et al. observed: patients reported a higher self-care burden when insulin was added to their regimen . Williams et al. found patients who feel their health care provider understands and supports them were more likely to have higher levels of self-confidence resulting in successful behaviour change . The self-care burden is largely the responsibility of the patient as Glasgow and colleagues emphasize; the patient is the one who must decide which diabetes self-care strategies to practice, and ultimately they experience the results of those self-care actions . Furthermore, Ockleford et al. suggests health professionals should tailor their patient self-care support based on the degree of personal responsibility the patient is willing to assume towards their diabetes self-care management . Patient preferences for group or private self-care management education should also be taken into consideration . Examining health-related behaviour from a theoretical context may further describe the diabetes self-care decision making process. Several constructs that possibly will help explain the behaviours required for successful diabetes self-care management are: self-efficacy, locus of control, health belief and health value. Self-efficacy is concerned with the perceptions a person has about their ability to perform a task and can influence the acquisition of new behaviours, while locus of control contends with an individual's perception of whether their action determines an outcome or is outside of their control [13, 14]. Health belief can be influenced by the person's perceptions of the perceived benefits of positive behaviour change, and health value interacts with locus of control to influence health-protective behaviours [15, 16]. The aim of the present study is to explore patient perceptions of diabetes self-care and to identify different self-care coping strategies among patients using qualitative techniques. Discussion of the patient self-care coping strategies and corresponding patient types is made in the theoretical context of the health belief, health value, self-efficacy, and locus of control frameworks to help illustrate the findings within the context of applied health science. A maximum variation sample of 17 patients was selected from GP practices and hospital diabetes clinics in the Irish Southern and East Coast Area Health Board regions, designed to include patients with types 1 and 2 diabetes, various self-care regimens, and a range of diabetes complications. We targeted approximately 50% males; at least 2 people younger than 35 years and at least 2 people older than 70 years; at least 60% with type 2 diabetes; 5 people with a duration of 5 years or less; at least 50% diagnosed with one or more diabetes complication (retinopathy, nephropathy, neuropathy); and at least 2 people following each of the self-care regimens (diet only, oral, insulin, and oral/insulin) (Table 1) . The age range of the patients was from 28 to 74 years, with a mean age of 60 years. Ethics approval was obtained from both the Cork University Hospital (CUH) and the Irish College of General Practitioners (ICGP) Ethics Committees. The study protocol and patient consent forms were reviewed, and approved by both committees. Recruitment took place over a six month period. Patients who provided the necessary characteristics required for the maximum variation sample were approached in the Cork University Hospital diabetes clinic by the lead researcher (Research Associate in Dept. of Epidemiology & Public Health, UCC) or were invited by their GP to participate in the study. The study objectives and methods were explained to all patients who were approached. Patients who agreed to participate were asked to give signed informed consent before the in-depth interviews. Data were collected by tape-recorded, one to one, in-depth open-ended interviews, ranging from one to one-and-a half hours in length. Interviews were conducted by the lead researcher in a private room in the department of Epidemiology and Public Health in Cork or the offices of the Irish College of General Practitioners in Dublin. The interview began with a chat to establish rapport, and a brief clinical history was obtained from each patient including: date of diagnosis; type of diabetes; type of regimen; and any other conditions associated with diabetes . Patients were asked to talk about their diabetes, and describe their daily routine. Then they were asked, "How does diabetes impact your life?" A topic guide developed from the Audit of Diabetes Dependent Quality of Life (ADDQoL) questionnaire, an instrument that measures how the burden of managing diabetes affects different aspects of life was used only if further probing was necessary . The audio transcripts from the interviews were listened to repeatedly for data familiarization by the lead researcher. Computer software (Annotape) was used to facilitate the transcribing and data coding process by annotating and indexing the original audio interview files and storing segments of tape with an open code that was as close to what the interviewee said as possible. The data analysis was conducted by the lead researcher. The data was examined for similarities and differences to open up ideas and add dimension to the patients' stories . Codes from all of the interviews were sorted in alphabetical order to provide a visual picture of the sample and facilitate grouping into categories. Each individual open code was compared to the rest of the open coded data to establish the categories . Similarities and differences across sub-groups were also explored. Conceptual diagrams were used to show relationships between the emerging themes and their dimensions to add further scope and support to the developing categories or themes . A senior qualitative researcher in the Department of Epidemiology and Public Health, UCC independently reviewed a random sample of five interviews (including audio tapes, field notes, and coding framework). Written feedback was provided to the lead researcher on coding and provided corroborating evidence of the logic of the decision-making . The methodology and final coding framework was also reviewed by one of the co-authors with extensive knowledge in qualitative research methods (CPB). 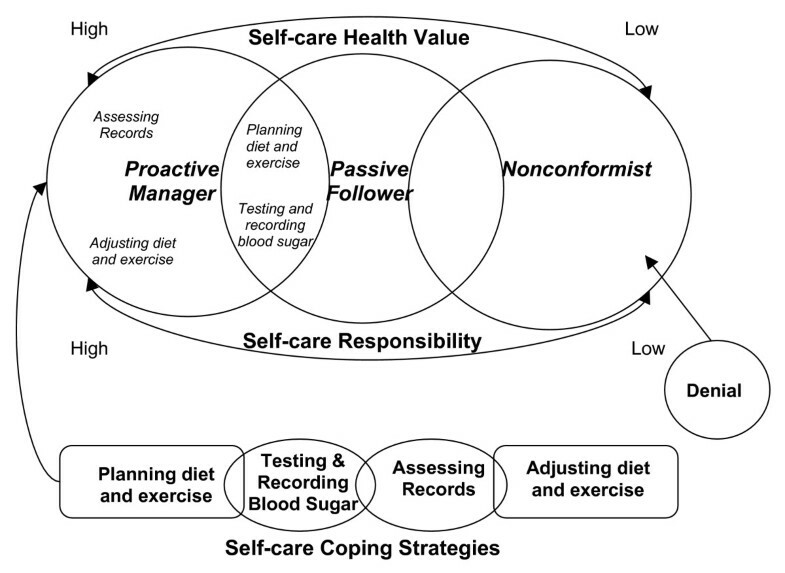 A picture emerged of the different diabetes self-care coping strategies across various patient types (see Table 1) [22–24]. Three major categories were identified and capture a wide range of self-care coping strategies: 1.) self-care health value (the value the patient places on diabetes self-care as it relates to his/her health on a continuum from high to low), 2.) self-care responsibility (who is responsible for self-care, which varied from complete personal responsibility to reliance on others for some areas such as diet, or denial of responsibility for self-care), and 3.) self-care coping strategies (five self-care coping strategies or themes were identified: planning of diet and exercise activities, testing, recording, assessment of blood glucose information, and adjustment of diet and exercise activities). Diagram of the Relationships Between Categories and Themes. The proactive manger adopts a healthy lifestyle. Many said that they viewed their diabetes as a condition, not a disease, which they had to manage. Although the numbers were small, there were more male proactive managers and most were using insulin or a combination of oral medication and insulin. The three key self-care characteristics of the proactive manager are: 1. high self-care value; 2. acceptance of personal responsibility for most aspects of diabetes self-care; 3. active planning of glycaemic control activities (testing, recording, assessment of blood glucose records), and adjustment of self-care as required (see patient en vivo quotes below). A proactive manager values the relationship between self-care and his/her ability to positively influence metabolic control, especially with daily blood glucose readings. A proactive manager takes a proactive approach to their self-care by using such strategies as reading product labels, planning meals, and assessing medication and blood glucose records for patterns. The proactive manager is very assertive with health care professionals and frequently questions things they do not understand, and many would also negotiate self-care treatment goals. However, it should be noted that some proactive managers are comfortable with the more complex self-care strategies, such as matching insulin to food, and some are not as flexible with self-care adjustment. The passive follower prefers structure to flexibility, with no variation in medication or meal times. Most of the passive followers had type 2 diabetes and used only oral medications. The key self-care attributes that define a passive follower are: 1. consistency in self-care; 2. reliance on others (family or healthcare professionals) for some aspects of self-care; 3. resistance to change once the routine or pattern has been established (see patient en vivo quotes below). The passive follower prefers consistency in their daily routine in order to cope with the burden that diabetes self-care places on their life. A characteristic that most of the passive followers shared was keeping blood glucose records. It should be noted, however, that the passive follower does not assess or change, his/her self-care independently, even if blood glucose readings indicated there is a problem. Passive followers want to fit into the ideal of the "perfect patient," one who conforms to the "ideal standards," even if this means forgoing an activity. However, passive followers will admit to breaking their prescribed dietary regimen some of the time. The last patient type, the nonconformist, did not adopt a healthy lifestyle. They do not follow many of the activities of their self-care regimen, especially prescribed dietary and activity changes. Most of the patients in the nonconformist group were using insulin or a combination of oral medication and insulin. Key characteristics for the nonconformist are: 1. lack of personal responsibility for diabetes self-care; 2. low self-care health value; 3. lack of planning, assessment, or adjustment of self-care (see patient en vivo quotes below). A nonconformist does not feel responsible for their self-care, and is often in denial about how diabetes will affect their future health. A nonconformist does not place much value on self-care and some even admit that they know what they are supposed to do but can't be motivated to make changes. A nonconformist would not actively plan meals or exercise, test blood sugar, or assess their self-care routine. Conversely, even though the nonconformist does not follow his/her dietary regimen and does not test blood sugar, he/she will admit to taking their medications. Patients' perceptions of their self-care varied on a spectrum, displaying differences in self-care responsibilities such as competence with dietary planning, testing blood sugar and regular exercise. The prescribed regimen and to a lesser extent gender may also account for some the differences across the patient types. To help describe our patient's self-care coping strategies we will use the health belief, health value, self-efficacy, and locus of control frameworks. A proactive manager is a patient who independently monitors blood glucose and adjusts his/her self-care regime to maintain metabolic control. Although the numbers were small, it is important to acknowledge there were more male proactive managers and most were using insulin or a combination of oral medication and insulin. Previous studies have reported that men with diabetes experience less disease impact and more treatment satisfaction than women possibly due to the different roles that men and women occupy in society [25–27]. Women have multiple role responsibilities and may find the diabetes regimen difficult to fit into their busy lives . Men on the other hand, are typically more narrowly focused with their roles and responsibilities and possibly less likely to let the diabetes regimen interfere with their life . Proactive managers believe their self-care is successful which is consistent with one aspect of the health belief model; belief of treatment effectiveness . They mentioned the feedback they received from their blood glucose readings told them how they were doing; therefore, testing, recording and assessing their blood glucose were self-care coping strategies that gave them some reassurance about the management of their diabetes self-care. Acceptance of personal responsibility for most aspects of diabetes self-care was another attribute that the proactive managers shared and is consistent with the construct of internal locus of control where an individual believes his or her own self-care behaviour determines or influences an outcome . The proactive manager accepts a high degree of responsibility for their health and believes there self-care actions will positively influence their metabolic control. The combination of personal self-care responsibility and high health value may explain why the proactive manager engaged in so many health-protective behaviours . The inclusion of insulin in the prescribed regimen of most of the proactive managers may trigger more complex glycaemic control behaviours like assessment of blood glucose records and adjustment of self-care in some individuals. The proactive manager's ability to self-regulate or assess and adjust patterns of self-care is a coping strategy that sets them apart from the passive followers and the nonconformists. Bandura found that the strength of individuals' self-efficacy or belief in their ability to perform a behaviour is directly related to how they cope with the new behaviour and may also impact their willingness to perform additional health-protective behaviours . Previous work in self-efficacy has consistently found that diabetes self-care behaviours are task specific or independent of one another, for example, an individuals' perceived capability to take their medication may be different from their perceived capability of testing their blood sugar . The proactive manager's explanations of their self-care coping strategies indicate they have mastered many different self-care tasks and are operating with a high degree of personal self-efficacy compared to the other patient types. Proactive managers enjoyed greater flexibility with meal times and food choices due to their coping strategies of pattern assessment and adjustment which allowed them to maintain metabolic control with more personal freedom. However, it should be noted there is some controversy surrounding the extent of independent patient self-care regulation. A recent study has called this proactive approach to self-care regulation "strategic non-compliance" which sends the wrong message to patients and providers with the label of "non-compliance" . Tattersall argues patients must have the freedom and approval from their providers to change their treatment, specifically patients with diabetes should feel empowered to make adjustments in their insulin dose to match their food choices . A passive follower is a patient who follows his/her prescribed self-care regime, but does not react autonomously to changes in metabolic control. The passive follower does not share the proactive manager's propensity for flexibility and prefers structure with no variation in medication or meal times. Most of the passive followers had type 2 diabetes and used diet or oral medications to control their diabetes. Passive followers tended to rely more on powerful others to help them make self-care decisions, such as a partner or family member for help with their diet, or the health professional for help with their self-care regimen; following the regimen was very important to the passive follower. This behaviour is consistent with external locus of control where individuals believe their health may be controlled by outside forces that are independent of their actions . Parry and colleagues also found when patients identified the main cause of their condition as outside of their control like genetic factors; they placed responsibility for disease management with health professionals . Furthermore, the passive followers reliance on powerful others may have indirectly affected their health value and in turn negatively influenced their adoption of health-protective behaviours like making changes to their lifestyle when their blood glucose readings indicated there was a problem. Since most of the passive followers were on diet only or oral medications, they may not be aware how to react to blood glucose problems, unlike the proactive managers who are able to match insulin to food or make lifestyle changes when their assessment of blood glucose records imply self-care change is needed. This finding is important for both patients and health professionals, as passive followers may need more support to help them make appropriate lifestyle changes, especially when their blood glucose readings show corrective action is needed. It has been noted in the literature both internal and external powerful other health locus of control were associated with regimen compliance using the Multidimensional Health Locus of Control scales . The fact that passive followers may be regiment compliant should not imply they do not need further training to adopt new behaviors which would allow them to make self-care changes independently. The passive followers may benefit from self-care decision support. There is real opportunity for the passive follower to acquire more health-protective behaviours which may help them to maintain better metabolic control. The nonconformist is a patient who does not follow most of his/her prescribed self-care regimen. The nonconformists felt things like their future health were not within their control; their coping strategy was one of denial. This finding concurs with Parry et al. who identified a similar group of patients (labeled as 'up to them') who regard the cause and management of their condition as outside their control . The nonconformist did not follow many of the activities of their self-care regimen, especially prescribed dietary and activity changes. Since the nonconformist believed their future health was outside of their control they did not engage in health-protective behaviours which is linked to low self-care health value. The nonconformist accepted minimal personal responsibility for their self-care which may indicate they did not believe preventative health actions like positive lifestyle changes would impact their future health . Many of the nonconformists were in denial of the seriousness of their condition, which may also explain why they suffered from more complications than either the passive followers or the proactive managers. It is interesting to note, like the proactive managers, most of the nonconformists were on insulin or a combination of oral medications and insulin. Previous work has shown insulin treated patients reported the most negative diabetes impact compared to patients on oral medication or diet only regimens . The nonconformist may believe that the burden of diabetes is insurmountable, and that adopting positive lifestyle behaviours is too difficult. Previous work however suggests that the nonconformist may benefit from group education where they are exposed to other patient's self-care success stories . It is important to note, the patient types were not static. No patient is a perfect fit or stays within type all of the time. The patient type is an analytical construct that allows us to ascertain similarities as well as deviations in typical course of conduct or, in the case of diabetes self-care, typical self-care coping strategies by patient type . Passive followers, more than any of the other patient types, want to fit into the ideal of the "perfect patient," following his/her prescribed self-care regimen and not taking action even when fluctuations in blood glucose indicate the need for change. Staying within type is not always possible. The passive follower will admit to breaking his/her prescribed dietary regimen, and not all proactive managers are comfortable operating with the more complex self-care strategies, such as matching insulin to food. It is important to note the limitations of this study. The study sample was heterogeneous and included both patients with types 1 and 2 diabetes which may account for some of the differences in coping strategies. The qualitative data was not longitudinal; therefore, no inferences can be made about behaviour changes that occurred over time. There was some disconfirming evidence among the patient types regarding the decision making process used to adopt new health-related behaviours that should have been probed in further interviews. However, this was not possible due to time and resource limitations. No one theory alone captured the range of patient self-care coping behaviours or strategies. All three theories in combination provide a much more complete picture of how people with diabetes cope with the burden of their self-care. Patients have different diabetes self-care coping strategies which are influenced by their self-care health value and consequently may affect their diet and exercise choices, frequency of blood glucose monitoring, and compliance with prescribed medication regimens. Thus, assessments and interventions should be comprehensive and integrate available theories for studying human behaviour to capture the full range of diabetes self-care behaviours. Particular attention should be paid to the patient's self-care coping strategy and self-care protocols should be tailored to complement the different patient types. Counseling on self-care coping strategies may be beneficial to patients with poorly controlled diabetes or those patients who want more flexibility in their self-care regimen. Gender, type of diabetes, and regimen should also be considered when counseling patients on self-care management. The findings from this study may be relevant to the design of quantitative instruments addressing self-care coping strategies in patients with diabetes and other chronic conditions. We acknowledge the Health Research Board, Ireland (grant reference number RP/16-/2002) for funding this project, and the contribution of Dr. Laura Frost for her review and insightful comments on the interviews and data analysis. MMC was involved in the study at the conceptual stage including: funding, ethics approvals, and managed study recruitment, data collection, data management, data analyses, and manuscript write-up. IJP conceived the study, obtained funding, supervised MMC on all aspects of the study, and helped write the manuscript. CPB contributed to the qualitative methodology, data analysis, and manuscript write-up. TOS contributed to the clinical input.